For almost exactly 40 years the term of Dunkeldeutschland was the prefered slang word for Western Germans to refer to their Eastbound Socialist sister state. And dunkel it was. Without the in-your-face approach of the Russian gulag the Ugly Germans of the East applied a more subtle and thus nastier version of beating their fellow people into submission to the state. Setting up a tight network of spies, surveillance and yes, snitches, that was not operating to keep out foreign forces, but to spy on each and every John Doe in the country the former GDR and its secret police called the Stasi had all means in its hands to drive the average man into insanity without even throwing a single punch. – With that in mind The Lives Of Others is not only another episode in our series of the Best Movies For Men. Just like the Grimm Brothers in the mid-19th century it also continues the great teutonic tradition of telling fairytales from Germany. And neither does this movie. Itse opening scene shows a gut-wrenching stasi interrogation that shows no more than what actually happened during the average interrogation held by Eastern Germany’s secret police. The ‘crime’ committed by the interrogated? He allegedly helped others prepare to flee the country. While the beginning shows Wiesler in full-force the stasi officer becomes more and more skeptical of the morals of the organization he works for. The fairytale character comes into play when Wiesler is set to observe famous playwright Georg Dreyman. Wiesler is set onto Dreyman not because Dreyman drew attention to himself as a possible dissident, but because a minister of the GDR has a romantic interest in Dreyman’s girlfriend, a well-reknowned actress. Feeling disappointed as he is used not to fend off “the enemies of Socialism”, but to help one of his superiors pressure himself onto a women Wiesler somewhat opens up to those he is assigned to observe: the Berlin scene of artists and intellectuals of the late 1980s. 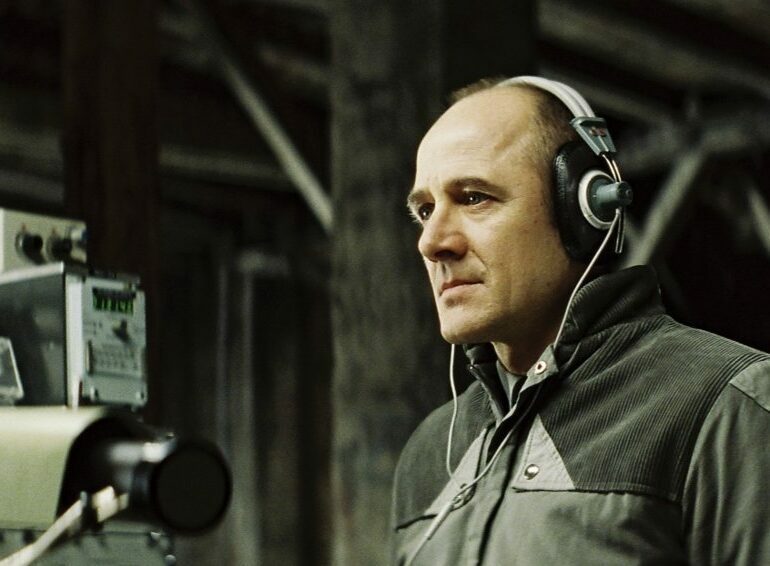 Observing Dreyman’s everyday life through headphones – Wiesler and his squad have wired up Dreyman’s apartment and set up post in the unused attic of the building – Wiesler gets drawn into the more humane and critical approach to life as presented to him by “the others”, i.e. the people he is observing. Inspired by the belief that true art will bring out the best in man the plot then continues to have Wiesler reach a turning point: he now identifies with Dreyman and those he is to observe and willingly acts on behalf of the others. In short, the German fairytale now is in full-bloom. film in Berlin-Hohenschönhausen, the memorial site located in what previously had been a Stasi prison. The more official reason for that had been that the local policy would only allow documentaries to be fimed on site, but not fiction. The actual reason semeed to be a tad different. The head of the memorial site thought the movie was ‘glorifying’ the Stasi and hence refused to give permission to shoot on site. While ‘glorying’ probably isn’t the right term the idea of having a long-served member of a force that did nothing but pressure, harrass and eventually destroy lives do a 180-degree turn and start to act out on behalf of his victims is as likely to encounter as the Wolpertinger. Even comparing Wiesler to Oskar Schindler, as has been done in the German Feuilleton, renders itself a useless comparison as Schindler was an entrepeneur and not a member of any police or military organization. You can and should believe in the good of man and everybody’s capability to change. But doing so in regard of the state is a futile undertaking. As a free-thinking man any form of state-like association is your enemy, not your possible savior. There were no good men in the Stasi. Not one, I'm a afraid.